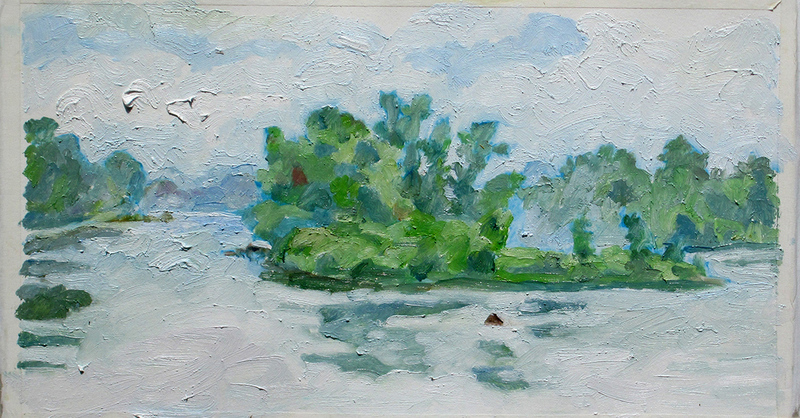 The theme of this year's painting trip was, apparently, “getting lost.” Which I did so many times. 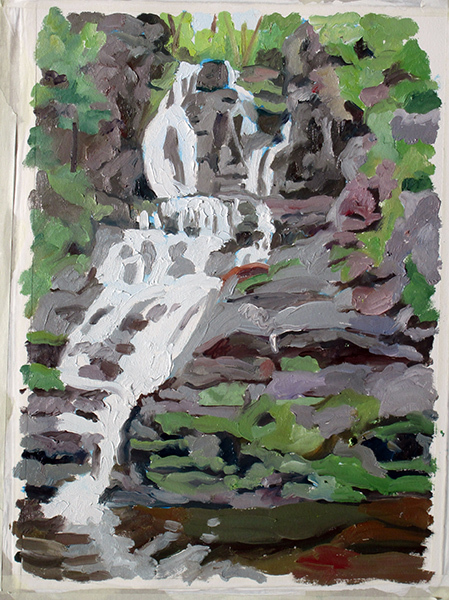 However, I had a blast, the weather was excellent, and herewith my painting log of the trip. A National Recreation Area is not the same thing as a National Park. The hallmark of a National Park is that you cannot turn around without being bowled over by a breathtaking vista. You have to work a little harder to find the breathtaking vistas in a National Recreation Area; they’re there, but if the breathtaking vistas were as easily found in a National Recreation Area as they are in a National Park, it would be called a National Park. When two states share opposite sides of a National Recreation Area, do not expect State No. 1 to direct you to the appropriate locations in State No. 2. I stopped off at the PA tourist center and asked the docent where the best, easily reached view of the Water Gap was to be found. He hesitated for a moment and then directed me to a site 30 miles to the north. As it happened that location was well worth a visit, but he certainly did not direct me to the sport approximately a mile away on the New Jersey side. Go figure. I decided to do my homework since I was headed to parts unknown, and Google mapped my trip. One route took me down 95, across the GW Bridge and then west into NJ/PA. An alternate route involved cutting through Hartford and taking what looked to be a more scenic route through New York State. I opted for Route 2, even though it was 20 miles longer. Everything was going fine until I got to Hartford and started looking for my exit (Exit 53, Route 6). There is no Exit 53 in Hartford, at least not any longer. Eventually I gave up looking at headed south to the GW. This was the first time I got lost on the trip. I set up camp and built a rather pathetic little fire. I was the only person in the tent area. Everyone else was ensconced in RV’s and mobile homes. The hootenanny started around 8 and went on until whenever. Fortunately that was the first and last time I was subjected to live outdoor music. 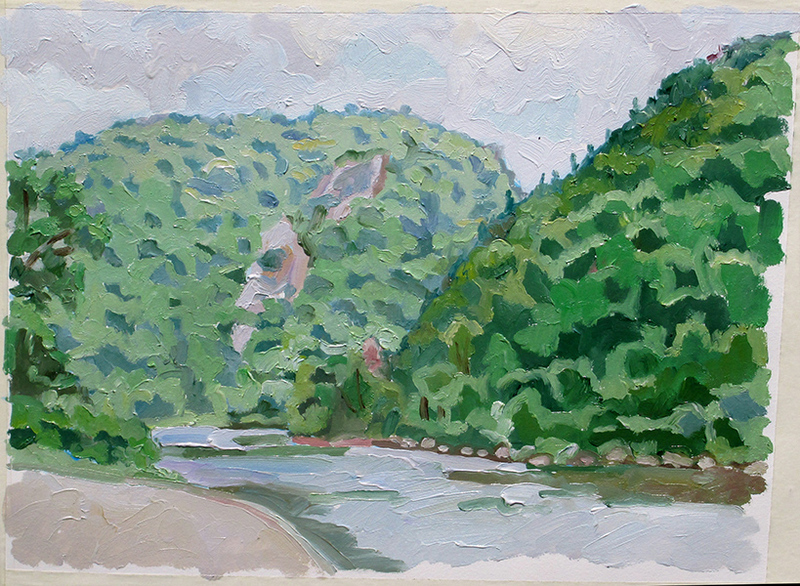 Painted this at site on River Road on Pennsylvania side of the Gap. Found alternate, much quicker route to campground, but it involved driving two miles on a gravel road. Built a much more successful fire. Freezing cold that night. Used my down sleeping bag and down comforter, then woke up in the middle of the night and put on winter coat, gloves, and wool hat. 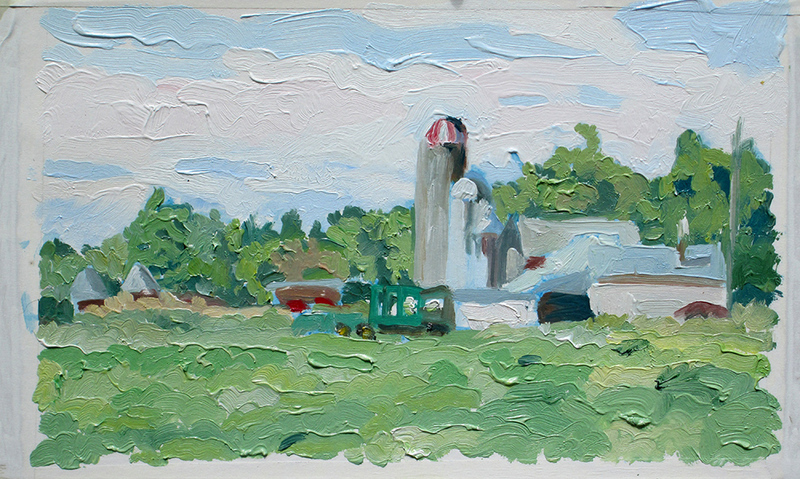 There is a lovely little working farm next to the camp ground and I did my first painting of the day there. While I was painting I noticed a large hawk circling over the farm. Soon there were seven hawks circling the farm and I thought “there’s no such thing as a flock of hawks.” They were turkey vultures, buzzards. Given the amount of road kill I saw in Pennsylvania, this is not too surprising. I now headed toward Dingmans Falls, the location the docent had directed me towards. However, on the way I could not prevent myself from stopping off at Bushkill Falls, a Franconia Notch-style tourist trap which billed itself as “The Niagara Falls of Pennsylvania.” Despite the obvious shlock appeal (“Buy a bag of mine tailings and pan for semiprecious stones! Every bag guaranteed to contain at least one semi-precious stone”), the waterfalls were actually quite impressive and the whole set-up pretty well done. Given the steepness of the terrain and the fact that the average age of the visitors seemed to be late 70's, I’m surprised I didn’t see people being medivac-ed out of the park. Since I was only about five miles from my original destination I decided to push on. The Inman Falls site is beautiful, the trail a raised wooden walkway you are requested not to step off of. There is a lovely little waterfall at the entry and beautiful groves of rhododendrons to walk through. As I neared the main falls I found myself praying “Please don’t be gorgeous. Please don’t be gorgeous.” But of course , they were, and I had to go back the next day. Overnight weather changed from freezing to sleep-in-your-underwear warm. Based on my suspicions as to the reliability of the Pennsylvania Department of Tourism, I tracked down the iconic view of the Water Gap–on the New Jersey side–at Kittatinny Point. Please note that the actual iconic view of the Water Gap can only be experienced by a vigorous hike to Kittatinny Ridge–one I did not make–or while actually driving through the Gap on Route 80. The “scenic overlooks” on both sides of the river were uniformly disappointing and, well, unscenic. For a lazy car camper like, interested in being somewhere beautiful to paint but not necessarily in getting there, the experience can be a little frustrating. 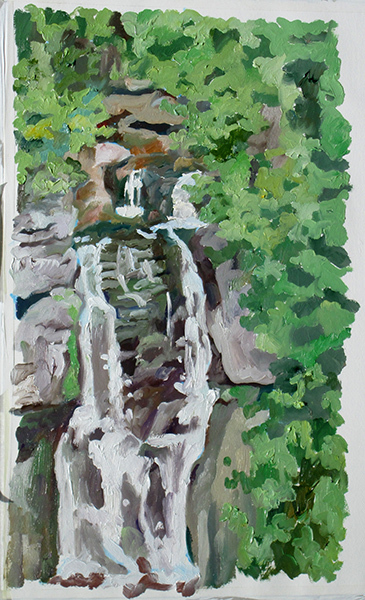 Drove back to Dingmans Falls and painted. I’m always surprised when someone shows up to a gorgeous nature spot like, clicks off an electronic roll of film, and leaves. It’s hardly what I would call “communing with nature.” On the other hand, two hippy-ish women showed up at one point with nine multi-racial kids ranging in age from a year to about twelve. They started to leave and then I heard one of the woman call “Hey! Down here!” Ignoring all the “Please do not step off the path,” “Please protect the fragile environment,” “Caution, rocks slippery and dangerous” signs, she and soon the rest of the group were playing happily in the water. Since the Park Rangers were nowhere to be seen (sequestration? ), they had their own way with no interference. I then returned to the New Jersey side, drove down a narrow country road, and did the above painting in Worthington State Forest. In its way, a second “iconic image” of the Water Gap. Packed up, drove up to Bronxville to visit with Sara at college, and then headed home, tanned, rested and relaxed. Bring it on!